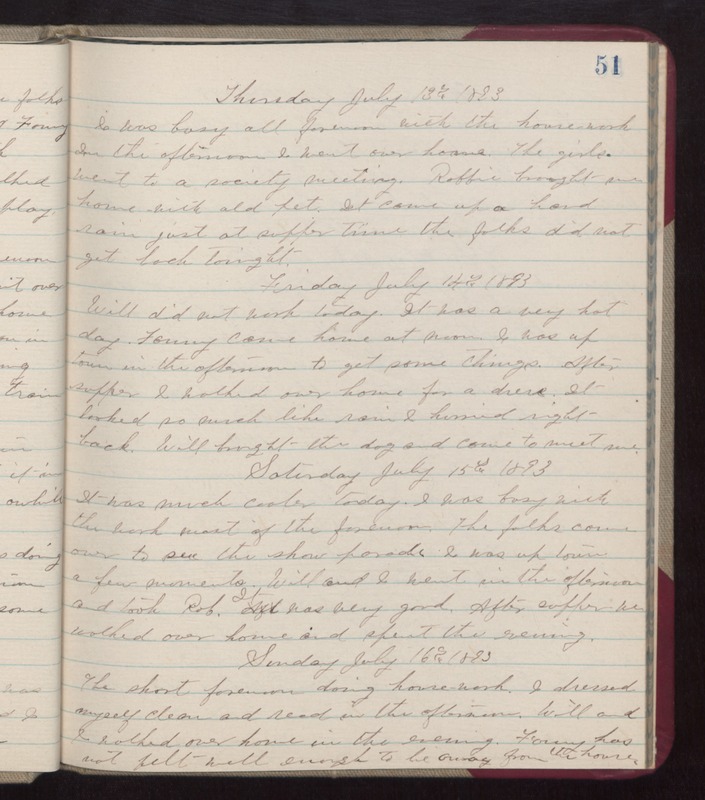 Thursday July 13th 1893 I was busy all forenoon with the housework. In the afternoon I went over home. The girls went to a society meeting. Robbie brought me home with Old Pet. It came up a hard rain just at supper time the folks did not get back tonight. Friday July 14th 1893 Will did not work today. It was a very hot day. Fanny came home at noon. I was up town in the afternoon to get some things. After supper I walked over home for a dress. It looked so much like rain I hurried right back. Will brought the dog and come to meet me. Saturday July 15th 1893 It was much cooler today. I was busy with the work most of the forenoon. The folks came over to see the show parade. I was up town a few moments. Will and I went in the afternoon and took Rob. It was very good. After supper we walked over home and spent the evening. Sunday July 16th 1893 The short forenoon doing housework. I dressed myself clean and read in the afternoon. Will and I walked over home in the evening. Fanny has not felt well enough to be away from the house.